Every year, the University of Wisconsin-Extension and the University of Wisconsin–Madison College of Agricultural and Life Sciences conduct a corn evaluation program in cooperation with the Wisconsin Crop Improvement Association. 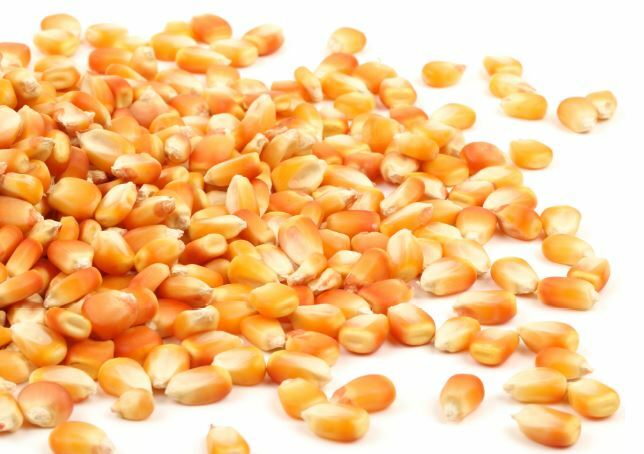 The purpose of this program is to provide unbiased performance comparisons of hybrid seed corn for both grain and silage available in Wisconsin. In 2015, grain and silage performance trials were planted at 14 locations in four production zones: the southern, south central, north central, and northern zones. Both seed companies and university researchers submitted hybrids. Companies with hybrids included in the 2015 trials are listed in Table 1. Specific hybrids and where they were tested are shown in Table 2. A summary of the transgenic traits tested in 2015 is shown in Table 3. A summary of seed treatment performance in 2015 is shown in Table 4. In the back of the report, hybrids previously tested over the past three years are listed in Table 24. At most locations, trials were divided into early and late maturity trials based on the hybrid relative maturities provided by the companies. The specific relative maturities separating early and late trials are listed in the tables. Seasonal precipitation and temperature at the trial sites are shown in Table 5. The 2015 growing season was similar to the 30-year normal from most of the season. A slight drought occurred in early August, but otherwise temperature, growing degree-day accumulation, and precipitation was normal. The planting season progressed quickly with all plots established by early May. Northern corn leaf blight developed along the southern two tiers of Wisconsin counties. A wind event in early July caused significant lodging in southern Wisconsin. Isolated incidents of Antrhracnose induced lofging have been reported in northern Wisconsin. No significant insect damage was observed. Beautiful weather was experienced during harvest with many locations having lower grain moisture than typical. Record grain and silage yields were measured. Test weight was lower than normal. The seedbed at each location was prepared by either conventional or conservation tillage methods. Seed treatments of hybrids entered into the trials are described in Table 4. Fertilizer was applied as recommended by soil tests. Herbicides were applied for weed control and supplemented with cultivation when necessary. Corn rootworm insecticide was applied when the previous crop was corn. Information for each location is summarized in Table 6. A precision vacuum corn planter using GIS technology was used at all locations, except Spooner. Two-row plots, twenty-five foot long, were planted at all locations. Plot were not hand-thinned. Each hybrid was grown in at least three separate plots (replicates) at each location to account for field variability. Grain: Two-row plots were harvested with a self-propelled corn combine. Lodged plants and/or broken stalks were counted, plot grain weights and moisture contents were measured and yields were calculated and adjusted to 15.5% moisture. Test weight was measured on each plot. Silage: Whole-plant (silage) plots were harvested using a tractor driven, three-point mounted one-row chopper. One row was analyzed for whole plant yield and quality. Plot weight and moisture content were measured, and yields were adjusted to tons dry matter / acre. A sub-sample was collected and analyzed using near infra-red spectroscopy. References to transgenic traits in this publication are for your convenience and are not an endorsement or criticism of one trait over other similar traits. Every attempt was made to ensure accuracy of traits in the hybrids tested. You are responsible for using traits according to the current label directions of seed companies. Follow directions exactly to protect the environment and people from misuse. Failure to do so violates the law. Yield results for individual location trials and for multi-location averages are listed in Tables 7 through 22. Within each trial, hybrids are ranked by moisture, averaged over all trials conducted in that zone during 2015. Yield data for both 2014 and 2015 are provided if the hybrid was entered previously in the 2014 trials. Starting in 2009, a nearest neighbor analysis of variance for all trials as described by Yang et al. (2004, Crop Science 44:49-55) and Smith and Casler (2004, Crop Science 44:56-62) is calculated. A hybrid index (Table 2) lists relative maturity ratings, specialty traits, seed treatments and production zones tested for each hybrid. Seed companies use different methods and standards to classify or rate the maturity of corn hybrids. To provide corn producers a "standard" maturity comparison for the hybrids evaluated, the average grain or silage moisture of all hybrids rated by the company relative maturity rating system are shown in each table as shaded rows. 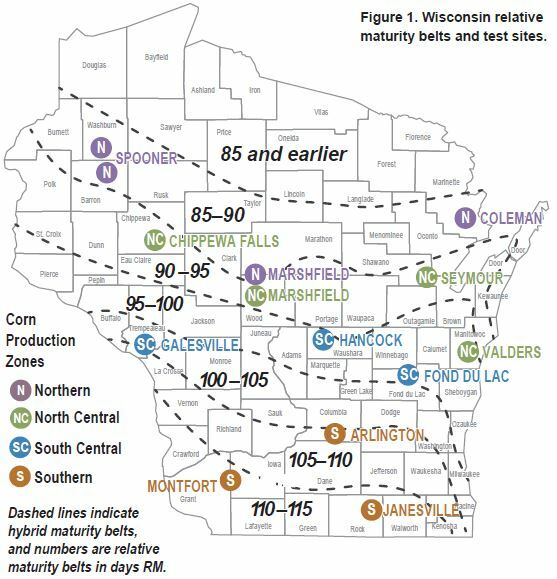 In these Wisconsin results tables, hybrids with lower moisture than a particular relative maturity average are likely to be earlier than that relative maturity, while those with higher grain moisture are most likely later in relative maturity. Company relative maturity ratings are rounded to 5-day increments. The Wisconsin Relative Maturity rating system for grain (GRM) and silage (SRM) compares harvest moisture of a grain or silage hybrid to the average moisture of company ratings using linear regression. Each hybrid is rated within the trial and averaged over all trials in a zone. Maturity ratings (company, GRM, and SRM) can be found in Table 2. Three factors-yield, moisture, and standability-are of primary importance in evaluating and selecting corn hybrids. A performance index (P.I. ), which combines these factors in one number, was calculated for multi‑location averages for grain trials. This performance index evaluates yield, moisture, and lodged stalks at a 50 (yield): 35 (moisture): 15 (lodged stalks) ratio. Corn silage quality was analyzed using near infra-red spectroscopy equations derived from previous work. Plot samples were dried, ground, and analyzed for crude protein (CP), acid detergent fiber (ADF), neutral detergent fiber (NDF), in vitro cell wall digestibility (NDFD), in vitro digestibility (IVD), and starch. Spectral groups and outliers were checked using wet chemistry analysis. The MILK2006 silage performance indices, milk per ton and milk per acre, were calculated using an adaptation by Randy Shaver (UW-Madison Department of Dairy Science) of the MILK91 model (Undersander, Howard and Shaver; Journal Production Agriculture 6:231-235). In MILK2006, the energy content of corn silage was estimated using a modification of a published summative energy equation (Weiss and co-workers, 1992; Animal Feed Science Technology 39:95-110). In the modified summative equation, CP, fat, NDF, starch, and sugar plus organic acid fractions were included along with their corresponding total-tract digestibility coefficients for estimating the energy content of corn silage. Whole-plant dry matter content was normalized to 35% for all hybrids. The sample lab measure of NDFD was used for the NDF digestibility coefficient. Digestibility coefficients used for the CP, fat, and sugar plus organic acid fractions were constants. Dry matter intake was estimated using NDF and NDFD content assuming a 1350 lb. cow consuming a 30% NDF diet. Using National Research Council (NRC, 2001) energy requirements, the intake of energy from corn silage was converted to expected milk per ton. Milk per acre was calculated using milk per ton and dry matter yield per acre estimates (Schwab, Shaver, Lauer, and Coors, 2003; Animal Feed and Science Technology 109:1-18). Variations in yield and other characteristics occur because of variations in soil and growing conditions that lower the precision of the results. Statistical analysis makes it possible to determine, with known probabilities of error, whether a difference is real or whether it might have occurred by chance. Use the appropriate LSD (least significant difference) value at the bottom of the tables to determine true differences. Least significant differences (LSD's) at the 10% level of probability are shown. Where the difference between two selected hybrids within a column is equal to or greater than the LSD value at the bottom of the column, you can be sure in nine out of ten chances that there is a real difference between the two hybrid averages. If the difference is less than the LSD value, the difference may still be real, but the experiment has produced no evidence of real differences. Hybrids that were not significantly lower in performance than the highest hybrid in a particular test are indicated with an asterisk (*). The results can be used to provide producers with an independent, objective evaluation of performance of unfamiliar hybrids, promoted by seed company sales representatives, compared to competitive hybrids. Use multi-location average data in shaded areas. Consider single location results with extreme caution. Begin with trials in the zone(s) nearest you. Compare hybrids with similar maturities within a trial. You will need to divide most trials into at least two and sometimes three groups with similar average harvest moisture-within about 2% range in moisture. Make a list of 5 to 10 hybrids with highest 2015 Performance Index within each maturity group within a trial. Evaluate consistency of performance of the hybrids on your list over years and other zones. Scan 2014 results. Be wary of any hybrids on your list that had a 2014 Performance Index of 100 or lower. Choose two or three of the remaining hybrids that have relatively high Performance Indexes for both 2014 and 2015. Check to see if the hybrids you have chosen were entered in other zones. (For example, some hybrids entered in the Southern Zone Trials, Tables 6 and 7, are also entered in the South Central Zone Trials, Tables 8 and 9). Be wary of any hybrids with a Performance Index of 100 or lower for 2014 or 2015 in any other zones. Repeat this procedure with about three maturity groups to select top-performing hybrids with a range in maturity, to spread weather risks and harvest time. Observe relative performance of the hybrids you have chosen based on these trial results in several other reliable, unbiased trials and be wary of any with inconsistent performance. Consider including the hybrids you have chosen in your own test plot, primarily to evaluate the way hybrids stand after maturity, dry-down rate, grain quality, or ease of combine-shelling or picking. Remember that you don't know what weather conditions (rainfall, temperature) will be like next year. Therefore, the most reliable way to choose hybrids with greatest chance to perform best next year on your farm is to consider performance in 2014 and 2015 over a wide range of locations and climatic conditions. You are taking a tremendous gamble if you make hybrid selection decisions based on 2015 yield comparisons in only one or two local test plots. This report is available in Microsoft Excel and Acrobat PDF formats at the Wisconsin Corn Agronomy website: http://corn.agronomy.wisc.edu. The most current version of Wisconsin Corn Hybrid Performance Trials (A3653) is also available to download as a PDF or purchase as a printed booklet at the UW Extension Learning Store: http://learningstore.uwex.edu. For more information on the Wisconsin Crop Improvement Association, visit: http://wcia.wisc.edu. Copyright © 2015 by the Board of Regents of the University of Wisconsin System doing business as the division of Cooperative Extension of the University of Wisconsin-Extension. All rights reserved. Send copyright inquiries to: Cooperative Extension Publishing, 432 N. Lake St., Rm. 227, Madison, WI 53706, pubs@uwex.edu. Authors: Joe Lauer is professor of agronomy, Kent Kohn is corn program manager in agronomy, and Thierno Diallo is research specialist in agronomy, College of Agricultural and Life Sciences, University of Wisconsin-Madison. Lauer also holds an appointment with UW-Extension, Cooperative Extension. Produced by Cooperative Extension Publishing. Photo credit: Sevie Kenyon, UW-Extension outreach specialist. University of Wisconsin-Extension, Cooperative Extension, in cooperation with the U.S. Department of Agriculture and Wisconsin counties, publishes this information to further the purpose of the May 8 and June 30, 1914, Acts of Congress. An EEO/AA employer, the University of Wisconsin-Extension, Cooperative Extension provides equal opportunities in employment and programming, including Title IX and ADA requirements. If you need this information in an alternative format, contact Equal Opportunity and Diversity Programs, University of Wisconsin-Extension, 432 N. Lake St., Rm. 501, Madison, WI 53706, Email: diversity@uwex.edu, phone: (608) 262-0277, fax: (608) 262-8404, TTY: 711 Wisconsin Relay. This publication is available from your county UW-Extension office (yourcountyextensionoffice.org), from the University of Wisconsin-Madison Department of Agronomy, 1575 Linden Drive, Madison, WI 53706, phone: (608) 262-1390, or from Cooperative Extension Publishing. To order, call toll-free: 1-877-947-7827 (WIS-PUBS) or visit our website: learningstore.uwex.edu.